In the last week, Pauline has performed two Maternal Assisted Caesarean Sections. 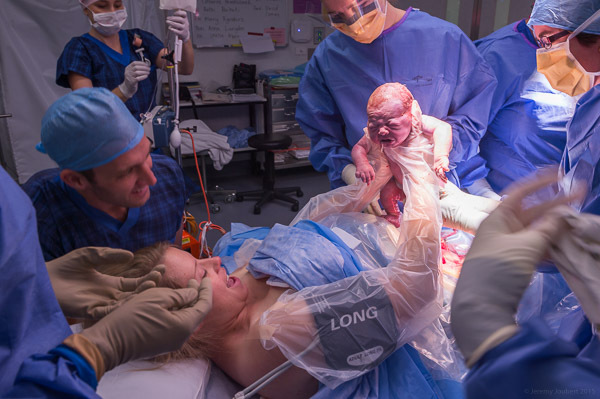 These are very similar to routine Lower Segment Caesarean Sections, however, the mother reaches down and assists with the delivery of her baby and places it on her chest. These were done after the two patients, who for various reasons required delivery by Caesarean, wanted to be actively involved in the birthing process. While not necessarily suitable for everyone or in an emergency situation, this does provide mothers with another option for the birth of their baby. During the antenatal period Pauline had lengthy discussions about the procedure with the patients and their partners. On the day of the procedure, following a rehearsal with all involved, the mother scrubs like the surgeon. Her hands and arms are then sterilised with a special solution and she dons full length gloves. After the obstetrician has delivered the baby’s head and shoulders, the mother reaches down and, with guidance from the obstetrician, lifts her baby out and up onto her chest for skin-to-skin contact where it remains if she and the baby are well.